Some options lead you to more specific choices in the Share panel. Other choices open a window where you log in to an account for sharing photos. The choices for sharing photos with other services open windows for logging in to your account and proceeding through steps to prepare and upload images. 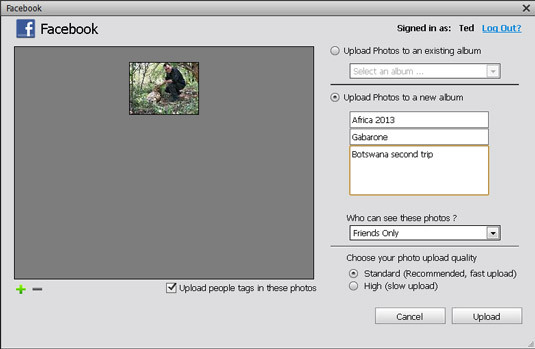 This is how the Share panel as it appears in the Organizer (left) and in the Photo Editor (right). The Photo Editor Share panel has a more abbreviated set of options. To bring Elements together on the Mac and Windows, Adobe has made the options in the Share panel identical on both platforms. 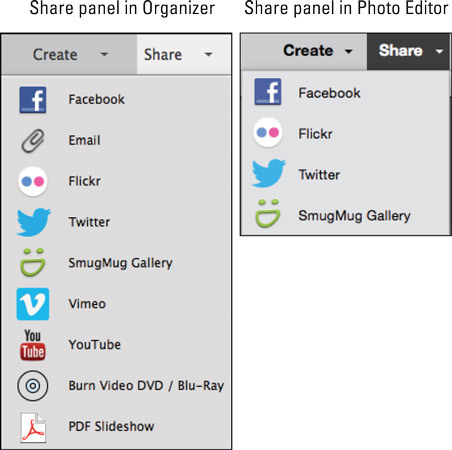 The Share panel as it appears in the Organizer (left) and Photo Editor (right). Rather than save your file from Elements and then open your email client and select the photo to attach to an email, you can use Elements to easily share photos via email with one click. In the Organizer, select the photos you want to email to a friend. Open the Share panel and select Email Attachments. The First time you try to email photos, Elements opens the Organizer Preferences panel and requires you to configure your email account. Fill in the text boxes and click OK. Check Convert Photos to JPEGs and choose a quality setting for the attachment and click Next. Drag the Quality slider and observe the file size noted at the bottom of the panel where you see Estimated Size. If the file is large, you may need to resize it in the Image Size dialog box before emailing the photo. Set the Quality slider to a medium setting for faster uploads to your mail server. The next panel provides settings for adding a message and adding recipients from an Address Book. Add recipients from your Address Book. If no recipients are listed in the Select Recipients panel, you can add recipient email addresses in the new message window in your email client. The photo(s) are first sampled to the output size. Wait a few minutes until Elements completes the sampling; then the photos are attached to a new email message in your default email client. Review the To, Subject, and Attach fields to be certain the information is correct. Then click the Send button. By default, Elements uses your primary email client application, which may or may not be the email program you use. You can change the default email client by pressing Ctrl+K (⌘+K on the Mac) to open the Preferences dialog box when you’re in the Organizer and then clicking Sharing in the left pane. If any of these items interest you, you can download a free trial of Adobe Premiere Elements and work with it for 30 days. If Premiere Elements is a tool you find worthwhile, you can purchase it from the Adobe Store. If you have not yet purchased Elements 14, you can purchase the Adobe Photoshop Elements 14 and Adobe Premiere Elements 14 bundle. Buying the bundle purchase is much less expensive than buying the products separately. You have a variety of options for sharing photos and placing orders on a number of service networks. There are too many options to cover here, so there are instructions for the more popular services as an example for connecting with a service provider. If other services interest you, poke around and explore options for the services you use. After you are logged in to a site, the process for uploading images is easy. After authorizing Facebook, the Facebook window permits you to choose an album or create a new one and add a description.